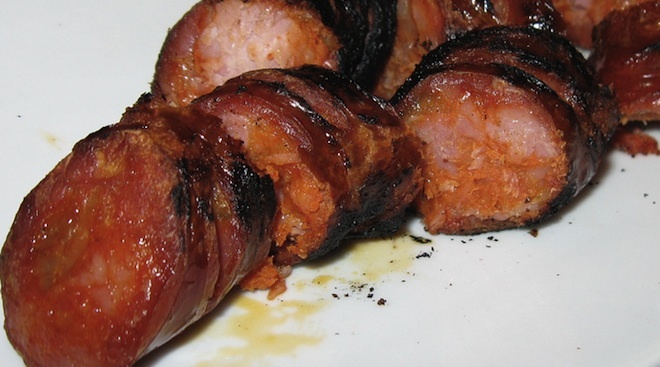 1) Lay the chourico out on a cutting board. 2) With a knife, make small cuts along the length of the chourico link in order to allow the insides of the sausage to be cooked as well. 3) Lay the chourico out over the assador de barro ceramic bowl. 4) Pour the cup of high content alcohol over the chourico and into the below bowl. 5) Be careful to let the alcohol drip out of the bowl in order to not burn anything but the chourico. 6) Now use a long lighter to light the liquid below and begin flame grilling the chourico. 7) Let the chourico flame grill until the alcohol runs out and the outside of the chourico should be well burned and crispy. 8)) Once done, serve immediately while hot.